The energy necessary to incline a vessel to a certain angle of heel and thereby counteract the MOMENT OF STATICAL STABILITY is called dynamic stability. The dynamic stability may be determined by measuring the area under the righting lever curve (GZ curve) up to a certain angle of heel. The larger the area, the better is the dynamic stability. Waves are the most common external force that causes a vessel to heel. Steep waves with short wavelengths are the most dangerous to small vessels. The relationship between a vessel’s dynamic stability and wave energy is complex and is, for example, dependent on the speed and course of the vessel in relation to the speed and direction of the wave. However, in general, the smaller the vessels, the smaller the waves they are able to cope with. You can either call the telephone answering machine 902-1000 (only available on Icelandic) or go the homepage of the Icelandic Maritime Administration www.sigling.is to find information about weather and seastate from beacons and wave buoys around Iceland like it is at each time. 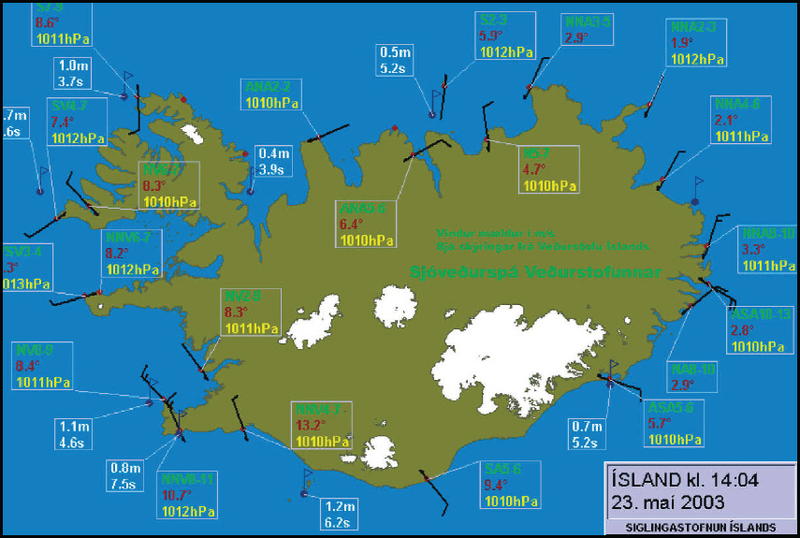 On this page you can also find wave forecast, forecast about dangerous waves, weather forecast, and forecast about tides and storm surges in ports and areas around Iceland. It is important to keep a close eye on the weather forecasts and thereby try to avoid seastate that can jeopardise the safety of the vessel.